In the year of our Lord 1654 the 17th of Febryin our afflicted Convent of the English poor Clares of Graveline is happily deceased this Life, Strengthened wth the Rights of our Holy Mothr the Church, Our Venerable and most Dr Mothr Abbess, Sisr Clare Marie Ann alias Tildesly the 68th year of her Age and 44 of her holy Profession, being one of the first that received the holly Habit in this Convent, which she has governed in quality of Abbess the Space of 39 years very Laudably and peaceably, haveing ever given a very rare Example of all sorts of Vertues and Sanctity, namely of an admirable prudence, Humility, Charity and tender Compassion towards all: she was endued with a Singular Fortitude & Constancy of Mind, with a perseverant Confidence in the Divine Providence amidst many Afflictions and heavy Crosses, which she sustained during the term of so long a Government, being Mother of all Cloisters of our holy Order, as well Irish as English, haveing received more than a Hundred to the holy Profession. She was endued wth great Piety & Devotion, with Guifts of Tears, and Suffred many long & painfull Sicknesses & Infirmaty with Singular Patience and Conformity,to ye Divine Will particularly her last, which was very Violent, and wherein she rendered her Soul most sweetly into the hands of her Creatour amongst the Prayers & tears of all her afflicted Children. Left Orphelines by the deprivation of so worthy a Mother, whose happy Soul we commend most instantly unto your holy Prayers and Charitable Suffrages. Requiescat in Pace. 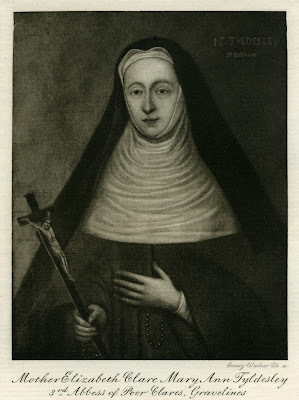 The above portrait is an engraving by Emery Walker for the Catholic Record Society from an original painting. More information regarding Elizabeth Tyldesley is available from the Who were the Nuns? website which records the research being undertaken by Dr Caroline Bowden and others at Queen Mary, University of London into the English Convents in exile.